Welcome to The Dormition of the Mother of God Orthodox Christian Church (Saint Mary's) which is a parish of the American Carpatho-Russian Orthodox Diocese of the U.S.A. whose presiding Bishop is His Eminence, Metropolitan Gregory of Nyssa. The American Carpatho-Russian Orthodox Diocese is an Autonomous Diocese under the spiritual protection of the Ecumenical Patriarchate of Constantinople of which His All-Holiness, Ecumenical Patriarch Bartholomew is the ruling Patriarch. Our Parish was founded over 100 years ago in the Southern Coalfields of West Virginia. The parish was located at Elkhorn, in McDowell County. Organized in 1895, the church building (which still stands) was built in 1912. Immigrant coal-miners from the Carpathian mountain region of Eastern Europe were the founding fathers of the parish. The old church was sold and a new church built in Bluefield, West Virginia in the year 2000. Since then, the church has experienced new growth, with Orthodox Christians from many different ethnic backgrounds becoming members, along with a number of American converts to Orthodoxy. Our parish could be called “Pan-Orthodox” because of the many different groups of people found here. There are nine ethnic groups represented in our parish; each one having unique traditions of food, chant, prayers, dress and other religious and cultural expressions. This is showcased each October during our ethnic food festival, pictures of which you can see on our multimedia page. Deeper and more powerful than ethnicity, however, is our common bond in our beloved Orthodox Faith, through which we have “put off the old man with his deeds; and have put on the new man, which is renewed in knowledge after the image of Him that created him; where there is neither Greek nor Jew, circumcision nor uncircumcision, Barbarian, Scythian, bond nor free: but Christ is all and in all.” (Col 3:9-11 KJV) Our Faith teaches us that we are given the opportunity to unite ourselves with Christ, primarily through the Holy Mysteries of Baptism and the Eucharist. The presence of Christ in our lives (His Divine Energies or Grace) then encourages us to struggle to become the people He wants us to be. Our lives are a process of becoming. This is a human issue, not an ethnic issue. This is why Orthodoxy is for Everyone, not just those whose last names sound exotic and foreign to American ears. Our parish is known for its warm, welcoming atmosphere. 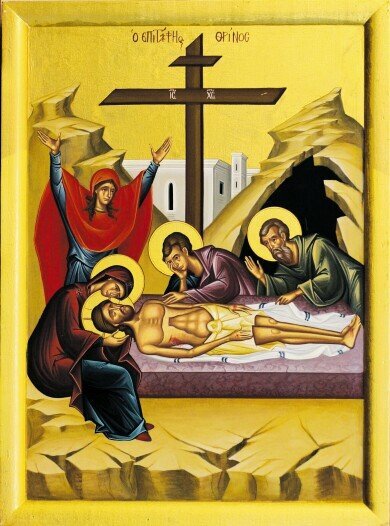 You are cordially invited to join us as we worship the One God in Trinity at Vespers on Saturday evenings celebrated at 6:00 p.m. Sunday morning Matins at 8:30 a.m. and Divine Liturgy, celebrated at 10:00 a.m. Other services are as scheduled, please see our monthly calendar for more information and a detailed list of events. 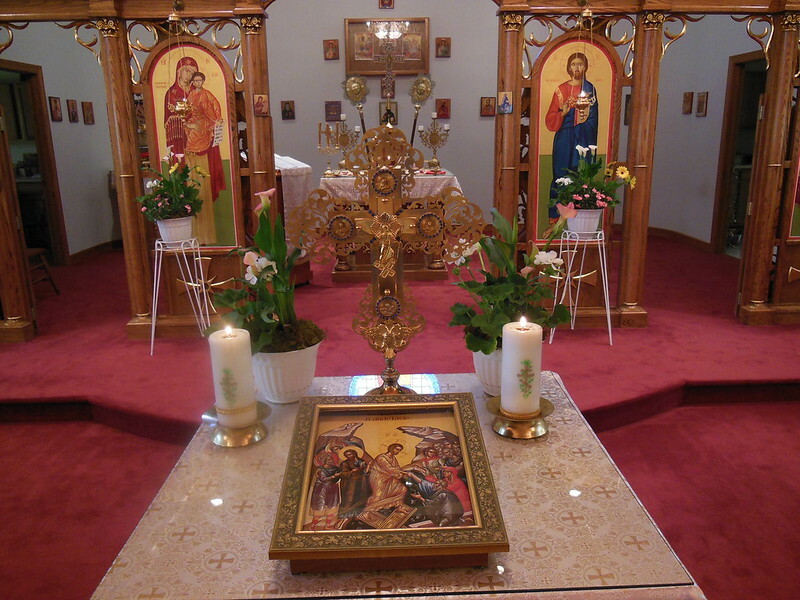 All are Welcome to come, see and become Orthodox, True Members of The Body of Christ, which is His Holy Church! All are Welcome to attend our Adult Education Classes on Wednesday Night at 6:30 pm to learn more about Orthodoxy, the Bible, and the teachings of the Holy Fathers of the Church! Following the banquet of the Liturgy which is a taste of the Eternal Banquet in the Kingdom of God, we gather in our Church hall for what we call “coffee hour.” A better name might be the agape meal, or meal of love. The food is prepared by those who have signed up to make it, and it reflects the different cultural backgrounds treasured in our community. Recently, we have enjoyed food from Lebanon, Palestine, Georgia, (in the Caucasus mountains) Romania and West Virginia. During this time after the Liturgy, people get to visit with each other, plan new church activities and enjoy time with their priest and his family. We have a Ladies’ Altar Society, that is busy with many projects, primarily with the organization of altar cloths and other vestments for the Church. They also work to decorate the Church with flowers, organize coffee hour meals, and keep the Church and hall spotlessly clean. They staff our annual Saint Nicholas Day Dinner every December which is open to the public to share some great food and fellowship. They also run St. Mary's Book and Gift Shoppe which offers many great Orthodox Books, many beautiful Icons, and other Orthodox items of interest. Our parish supports the Union Mission of Bluefield, WV especially during the Thanksgiving season. Food and monetary donations are collected to help this very worthy and essential organization which serves the poor and downtrodden of our corner of Appalachia. Craig Hammond, director of the Bluefield Union Mission is familiar with our Church family and regularly hosts our Pastor on his radio show which covers many local issues, including those having to do with Orthodox Christianity in the area. Orthodoxy is for all people, all races, all generations, at all times since the Apostles first went out to preach to both Jew and Gentile. We Welcome New Visitors almost every Sunday and we would love to welcome YOU! Consider a visit to that “gold-domed Church up on East River Mountain.” It just might be the most beautiful thing you’ve ever seen. May God bless you!